The world leading Electronics manufacturing company Acer has introduced a new war machine Predator G6, come along with a unique and eye-catching body design, awesome and enthusiastic details, pleasing features, and super fast processing power and high-end graphics. The Predator G6 has powered by the world’s most demanding operating system of Microsoft, Windows 10 which allows flawless switching between programs and rapid loading of heavy games and super fast performance. The Predator G6 is made for 4K gaming and prepared for virtual reality with the cutting edge of high-end gaming. 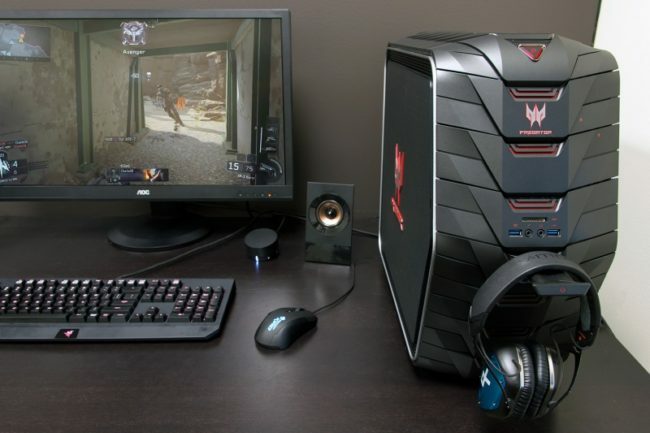 The Predator G6 is enabled with the easy-swap expansion bay, accessible ports and a headset cradle for the user convenience, the G6 has an intimidating armor-inspired design a full supply of ports makes this desktop a real war machine. The G6 Desktop equipped with the latest audio technology of SoundBlaster X-Fi MB5 which gives you a distortion free and crystal clear sound so you can enjoy a true gaming sound experience. The Acer Predator G6 has been empowered with the world’s super fast, rapid performing, and powerful i7-6700k 6th Generation Intel Core processor integrated with NVIDIA GeForce GTX 980 Ti. The Acer G6 desktop has come along with the lightning fast speed of 64 GB RAM (DDR4 2133 MHz) which is amazing and you can switch programs and load even heavy games in a blink of an eye, and a 2 TB of perplexing storage for the bulk of your library, games, and screen shots. The Acer G6 has surfaced with the black color with a touch of silver shaded finish over devil red LEDs light.